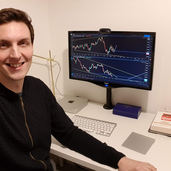 About me UK Based FX trader. AUDJPY Short on break of continuation triangle pattern. AUDJPY Short on break of continuation triangle pattern. This entry was taken via pending order on the break. The stay complete the move down to the beginning of the larger correction to retest the lows which would be 6.5%. Produced a nice entry setup and looking for more downside over the week. Already risk free. Double top within ascending pattern. AScending channel is a continuation pattern to continue down. Double top looks like giving a retrace on the earlier news spike up. Break of descending wedge structure, Impulsive move on H4 chart. Potential to move back up to the start of the structure.